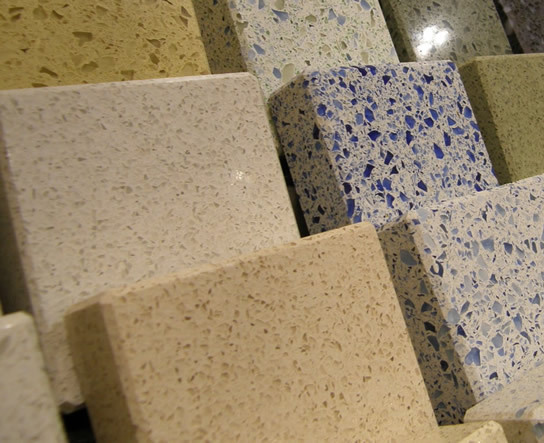 Engineered stone quartz surfacing is made from approximately 95% natural quartz and 5% polymer resins (by weight). Testing has shown that they retain much of the toughness of quartz but display increased ductility due to the resin, improving impact resistance. Countertops are custom made and more scratch resistant as well as less porous than natural quartz surfaces, and don't need to be sealed like other stone surfaces. Thicknesses may be 1/2 inch, 3/4 inch, 1¼ inch or 1½ inch. Brands include Hanstone, NaturaStone, Silestone, Q, Caesarstone, Technistone, Cambria, and Zodiaq.